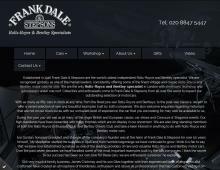 Established in 1946 Frank Dale & Stepsons are the world's oldest independent Rolls-Royce and Bentley specialist. Frank Dale are recognised globally as one of the market leading Rolls Royce and Bentley dealers in London, France and Japan, consistently offering some of the finest vintage, classic and modern Rolls-Royce and Bentley's for sale. Frank Dale are the only Rolls-Royce and Bentley specialist in London with showroom, workshop and upholsterers under one roof. The July 2017 Newsletter has a wonderful feature all about the Bentley Continental and lists several outstanding examples of Bentley Continentals for sale in their London showroom. Collectors and enthusiasts come to Frank Dale & Stepsons from all over the world to look at our outstanding selection of Rolls-Royce and Bentley motor cars.